Natural talent can only take you so far in sport and golf is certainly no exception. 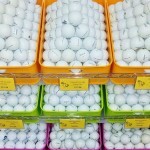 Even if you are not the most talented golfer in the world, regular practice can help to improve your game immeasurably. In this article, we will look at a number of golf training aids available on the market that will enhance every area of your golf game, from tee to green. Nothing is more important in the game of golf than your swing. The Izzo Smooth Swing Trainer helps to improve the essential elements of your swing, keeping your body and arms together and in sync. This helps ensure that your swing is far more efficient and that your tempo is correct which results in greater distance and accuracy. Not only that, but it also helps produce a more consistent takeaway and a far larger extension for both your backswing and follow through. Best of all, it is cheap, portable and allows you to practice your swing anywhere. 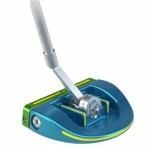 An attachment that fits on your golf club, the MECO Swing Trainer aims to correct swing positions. It does this by ensuring the correct hinge position when you reach the top of your backswing. It also helps you use proper face alignment throughout your golf swing arc. This leads to not only a more fluid swing but increased distance and far better accuracy. Soon, you will be shooting lowers scores than ever before. It is suitable for left or right handed golfers. This simple trainer not only will help to improve your swing but it will develop all the core muscles you use while playing golf, an excellent way to remain “golf” fit even if you are not getting out on the course. If you have a problem with slicing, the Gold Flex is for you, helping to flatten your swing plane and using your lower body to start the all-important downswing, ensuring everything remains on course. Easily carried in your golf bag, the Gold Flex is also an excellent way to get your swing in the groove before the start of your round. A very different, yet effective golf swing training aid, the Molor Flatball is a small rubber disk that is the same diameter as a golf ball but flatter. In fact, it only stands ¼ of an inch high off the ground. The idea behind this swing aid is to practice hitting it consistently. Because it is lower than a golf ball, this can be tough, especially if you have the incorrect swing plane. Once you begin hitting it consistently, you can be sure that your days of hitting a ball too fat or too thin are over. 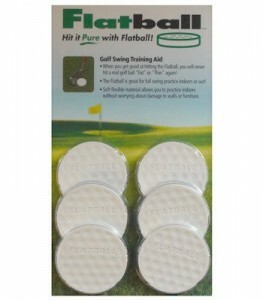 Due to its soft rubber construction, the Flatball can be used indoors as well without the fear of damaging anything. The SKLZ Pure Path Swing Trainer needs to be anchored in the ground outside, but you will require no practice net. This sturdily constructed swing trainer helps to give you feedback regarding your golf swing, effectively helping to eliminate pulls, slices, hooks and pushes, all swing problems that take meters off your overall distance. Using a real ball, you can use any club in your bag with the Pure Path Swing trainer, from woods to wedges. With many training videos to be found on Youtube, Golfnsticks are a favorite of PGA Tour players as well as instructors. They can be used in a number of unique training drills from alignment and correct ball positioning to a proper swing plan and when putting. By using Golfnsticks, you will improve your game quickly, enabling you to hit fairways more often and make more greens in regulation, thereby improving putting statistics. Best of all, Golfnsticks are portable and very well priced. A bag made from PVC and nylon, the smash bag impact trainer is all about feel. It aims to teach you how it feels when you hit a golf ball correctly, thereby helping to eliminate fat or thin shots right out of your game. A target map also provides important visual cues with regard to both the accuracy of each swing as well as the overall quality of the impact. The great thing about the Smash Bag is that it can be taken anywhere, or even used indoors. This unique putting trainer helps improve putting immeasurably. You know what they say “You drive for show, but you put for dough.” This system uses a two stripe alignment template which helps to improve body alignment over the ball ensuring you are standing neither too far nor too close when addressing your put. Furthermore, it helps to keep your eyes directly over the ball. Lastly, the putter wheel helps to increase any error you may have made, helping you to understand where you went wrong. A cost effective training aid, the Tiba Putt specifically focuses on the impact zone of the ball when putting. It helps to ensure the correct path through the impact zone and that the putters face is kept square at all times, meaning you will hit the sweet spot more often. This gives far greater control over longer putting distances. The system, used by many PGA and LPGA tour pros, stores easily in your golf bag. The beauty of these golf training aids are that there is something for any part of your game that you may be struggling with, be it putting, your swing or ball striking. Many of them are simple tools that can be carried with you in your golf bag. Some can even be used at home, meaning you can practice with any free time you may have. Remember, practice makes perfect!